This is my first solo attempt at using the sewing machine. 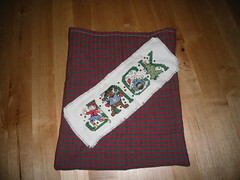 This Christmas themed name tag is one I made for Jack ages ago from one of my cross stitch alphabets and some beading. I have been looking for something to attach it too for ages, and was thinking about using it on a Christmas Stocking. But now I have some lovely patterns for stocking that I want to use instead. I think this fabric is ideal for Christmas stuff, so I sewed a little bag, and then sewed the name tag on. It's really sweet and i think it will be perfect for stashing all of his chocolate and snacks he's bound to get at Christmas.